Donations are a huge part of what make the Celebrate MSC Benefit Auction a huge success. Special programs and facilities that you see every day here at MSC have been funded in part by our annual auction. 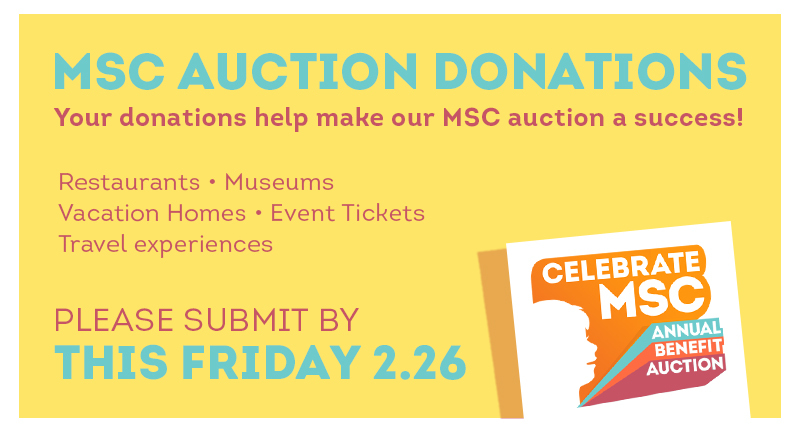 So celebrate what you see by asking local businesses, friends, and employers to donate what they can to the MSC auction! The auction is quickly approaching, so we are asking to have donations in by THIS FRIDAY, FEBRUARY 26. Donation forms can be found at ps333.org/celebrate.